DENVER, April 18, 2017 /PRNewswire/ -- MusclePharm Corporation (OTCQB: MSLP) ("MusclePharm" or the "Company"), a scientifically-driven, performance lifestyle sports nutrition company, announced today that it has formed a three-year strategic partnership with Munster Rugby, Ireland's leading professional provincial rugby team and two-time winners of the European Rugby Champions Cup. MusclePharm harbors existing partnerships with other world-class sporting organizations, including New Zealand's premier rugby outfit and current Super Rugby champions the Hurricanes. Under the terms of this latest agreement, MusclePharm will serve as the official sports nutrition partner to Munster Rugby. The team will be exclusively supplied with MusclePharm's superior sports nutrition and post-workout recovery supplements which have been certified by Informed-Choice as containing no banned substances. MusclePharm's branding will be prominently featured throughout a number of channels including product integration, promotional training sessions, sampling days, print media, online digital activity and in-stadia assets at Munster Rugby's home stadiums of Thomond Park and Irish Independent Park. 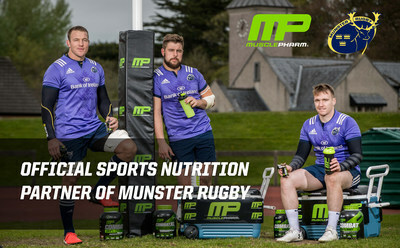 As Ireland's preeminent provincial rugby team with a rich heritage of more than 130 years, Munster Rugby has a loyal and expansive international following that enables MusclePharm to significantly enhance its global brand visibility. The team's dedicated fan base spans several continents, with millions of viewers worldwide tuning in to Munster's televised games each year. "Entering into this partnership with Munster Rugby underscores our commitment to serving athletes of all types and all levels with outstanding nutritional supplement products, free of banned substances, that complement their sports and lifestyle, while simultaneously furthering our global expansion goals," said Ryan Drexler, CEO, MusclePharm. "MusclePharm currently boasts a strong brand presence in Europe and, by partnering with Munster Rugby, we have a unique opportunity to reach an exceptionally engaged audience in Europe and beyond. Furthermore, the addition of another professional sports team to our user base serves to showcase our products' efficacy and ability to adequately support the demanding lifestyles of dedicated athletes everywhere." "Partnering with MusclePharm makes perfect sense for both our players and fans," said Enda Lynch, Munster's Head of Commercial & Marketing. "MusclePharm is a brand known for its high-quality ingredients, commitment to label transparency and – most notably – the results it helps athletes achieve. We look forward to working closely with the company in a number of areas to provide meaningful brand experiences." Munster Rugby participates in both the Pro12 and European Rugby Champions Cup, and will face defending champions Saracens in the prestigious European Rugby Champions Cup semi-finals in Dublin on April 22nd 2017. This match will be televised across five continents. MusclePharm products – including Combat 100% Whey, Combat Protein Powder, Combat 100% Isolate, Combat 100% Casein, Assault Sport, Amino1 and Combat Crunch – are available in reputable retail outlets throughout Europe.